1991 Chinese Gold Panda produced by the Chinese state. 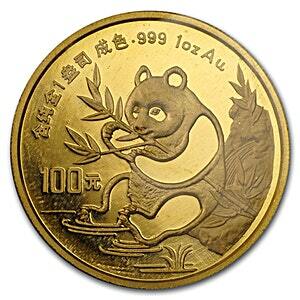 Gold Pandas have been produced since 1982, and are minted in sizes of 1/20 oz, 1/10 oz, 1/4 oz, 1/2 oz and 1 oz. The reverse of the Gold Panda depicts an adult panda whereas the obverse features Hall of Prayer for Abundant Harvests in the Temple of Heaven in Beijing. The 1 oz Gold Panda has a face value of CNY100.